Design your own 8×8 Scrapbook Pages online! No more scissors, tape or glue is needed when you create your scrapbook pages online using MailPix’s scrapbook page layout templates. If you’re looking for wedding scrapbook page ideas, this is your final destination; MailPix offers elegant templates for scrapbook page layouts. 8×8 Scrapbook pages fit your 8×8 sized scrapbooks perfectly. Just add photos and text to your selected artwork and order. 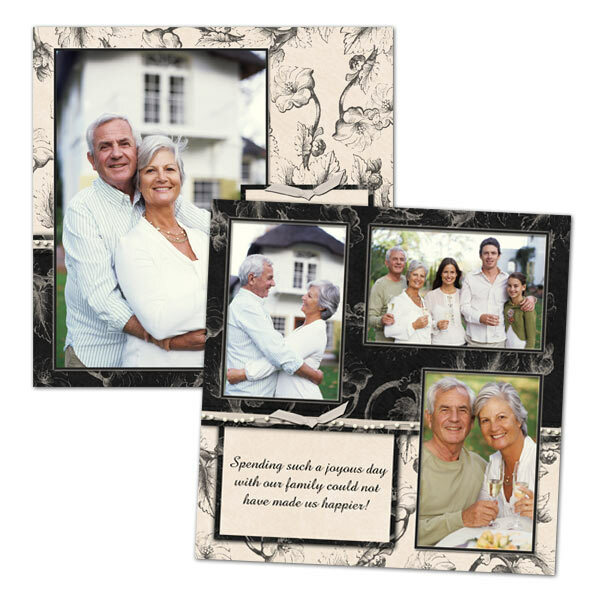 If you design your own 8×8 scrapbook pages using a photo editing software, we also have 8×8 photo prints that look great displayed in an elegant frame. Our other Scrapbook Page sizes include 5×5 digital scrapbook prints and 12×12 Scrapbook Pages so you can get the perfect fit! Create Your Own Scrapbook Pages? You don’t have to use our styles when ordering scrapbook prints, if you create your own using a photo software or another means, simply upload your pages to our site and order the size that best fits your scrapbook!